Red or green? Milk chocolate or peanut? Mega or mini? You may know your favorite color and variety of M&M's, but there’s still a lot you probably don’t know about the candy that melts in your mouth, not in your hand. Here are a few colorful facts to snack on. 1. SPANISH CIVIL WAR SOLDIERS PROVIDED THE INSPIRATION. Forrest Mars Sr., son of the Mars candy company founder, had a falling out with his illustrious father, and in 1932 went to England to try and go it alone in the confectionery business. The story goes that on a visit to Spain during the country’s civil war, he observed soldiers eating chocolate candies encased in a hard, sugary shell. This was a revelation to Mars who, like any good candy maker, knew that chocolate sales plummeted during the summertime, for obvious reasons. But it may also be a cover for a much less revolutionary truth: That Mars copied the idea from another company. English candy maker Rowntree’s of York came out with Smarties, the hard-shelled chocolate candies, in 1937, during Mars’ prolonged stay. The early success of Smarties may have caused a light bulb to go off in Mars’ brain. Whatever the case, Forrest Mars developed a manufacturing process for M&M's Chocolate Candies, patented it, and in 1941 began making them out of a factory in Newark, New Jersey. After Mars came up with the idea for M&M's, he approached Bruce Murrie, son of Hershey’s Company president William Murrie, about going into business together. In addition to a financial partner, Murrie turned out to be a strategic ally for Mars since Hershey’s dominated the production of rationed chocolate during World War II. Murrie received a 20% stake in the company, and for several years M&M's were made using Hershey’s chocolate. The two M’s didn’t see eye-to-eye on the company’s direction, however, so in 1949 Mars bought out Murrie for $1 million and took control. 3. THE “M”S WEREN’T PRINTED ON THE CANDY AT FIRST. 4. THEY ORIGINALLY CAME IN CARDBOARD TUBES. It turns out the plastic tubes that M&M's Minis come in today are the closest thing the company has to its original packaging. 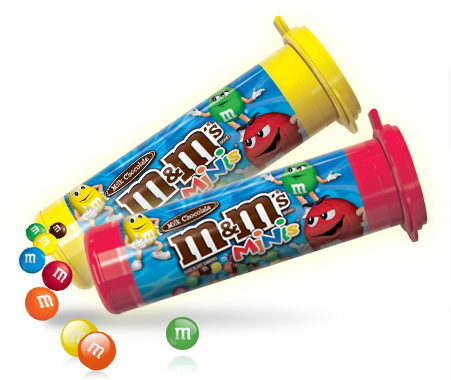 The cardboard tubes M&M's originally came in made them easy to pour and ship, and it added to their durability. They were a hit with World War II soldiers, many of whom carried them around in their rations and remained loyal after the war was over. Not until 1948 did Mars come out with the dark brown bags that are used today. 5. PEANUT M&M'S CAME OUT IN 1954. Nowadays M&M's are available in everything from dark chocolate to pretzel varieties, and in sizes that range from mega to mini. But the first spin-off was the tried-and-true peanut M&M, developed by Mars less than 15 years after his original candies began rolling off the production line. They were only available in tan at first, then in 1960 came available in the same colors as the plain variety. Fun fact: Mars was actually allergic to peanuts, and so he never actually got to taste his creation. 6. RED M&M'S DISAPPEARED FOR A DECADE. In the early ‘70s, a Russian study came out linking the red food dye amaranth (also known as Red No. 2) to cancer in humans. Subsequent testing never proved the ingredient to be dangerous, but in 1976 the Food and Drug Administration, erring on the side of caution, decided to ban its use in America. Although red M&M's didn’t actually contain amaranth, the company pulled the color and replaced it with orange to avoid any confusion. For 10 years the now-iconic red M&M stayed on the bench. Its comeback began in 1982, when an undergrad at the University of Tennessee named Paul Hethmon decided to create the Society for the Restoration and Preservation of Red M&M's. The organization was a spoof on junk-mail campaigns that were popular at the time, and asked people to send $.99 for a lifetime membership. The joke quickly caught on, and in 1983 Hethmon received a membership application from none other than the PR manager at M&M's Mars. Four years later the red candies were back in circulation (they kept orange around, too). 7. THE COMPANY PASSED ON ONE OF THE GREATEST PRODUCT PLACEMENT OPPORTUNITIES EVER. While preparing to film the movie E.T., Steven Spielberg approached Mars asking if he could use M&M's in the scene where Elliott lures the shy alien out from the forest where he’s hiding. It’s not clear exactly why Mars passed on the opportunity—everything from “ad budget was full” to “they thought the movie would tank” has been forwarded—just that they did. So Spielberg took the idea to Hershey’s, who pounced. Apparently Spielberg wanted to use Hershey Kisses, but the company insisted he use its new Reese’s Pieces candies. The result was a massive success for Hershey’s, with sales of Reese’s Pieces shooting up at least 65% in the two weeks following the film’s premier. 8. VAN HALEN INCLUDED THEM IN THEIR RIDER. Many people know about the band’s notoriously picky rule, which required venues to provide M&M's backstage with all the brown candies taken out. Many people at the time saw this as further proof that rock stars were all pompous, juvenile idiots. But years later, lead singer David Lee Roth revealed that the stipulation was actually a test. A venue that couldn’t remove brown M&M's, after all, might not be attentive enough to the security needs or the exact sound specifications the band needed to perform. If a venue failed to remove all the brown M&M's from the band’s stash, Van Halen would abruptly cancel, and often trash the place for good measure. 9. THERE ONCE WAS A COW MADE OF 67,000 M&M'S. Mars may have missed the boat with E.T., but its promotional savvy has been consistent over the years. Case in point: “Candy” the M&M cow, made from 67,000 M&M's, all of which were painstakingly placed by hand. Created for display at the 1990 Erie County Fair, Candy was also photographed and written up by Newsweek and various other publications, and made an appearance on Live with Regis and Kathie Lee. It’s estimated the low-cost stunt had a $1 million promotional value for the company. 10. GREEN M&M'S ARE RUMORED TO BE AN APHRODISIAC. 11. THERE’S A LOT OF NOSTALGIA FOR TAN M&MS. In the mid ‘90s, Mars decided that having both a tan and brown M&M was redundant and a bit too dreary for a modern candy brand. So the company decided to replace tan with pink, purple or blue in a consumer voting campaign that proved immensely popular. Fans eventually chose blue, of course, but 20 years later there are those who look back fondly on tan as a muted relic of a bygone era. In the spirit of Paul Hethmon, there have even been a few online petitions for the company to bring back tan. 12. THEY’VE PLAYED A MAJOR ROLE IN DIETING RESEARCH. Partly due to their popularity, and partly due to the fact that they’re small, durable and divisible by color, M&M's have been used in all sorts of dietary studies aimed at revealing the bad eating habits we’ve relied on over the years. 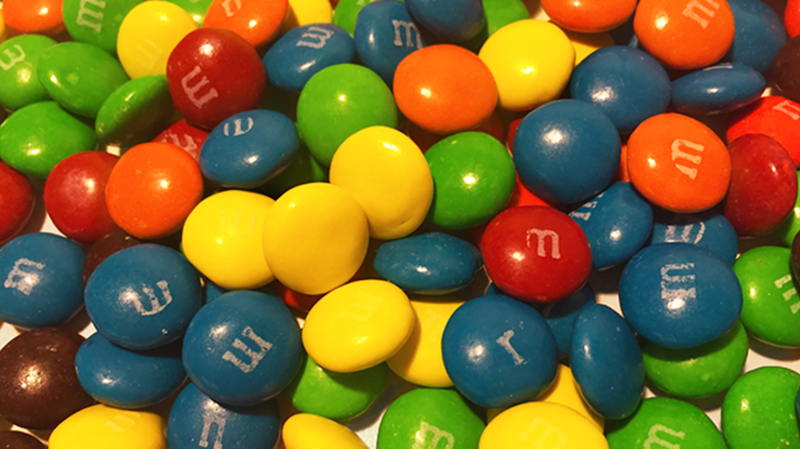 One study revealed that participants given a wider range of colors ate more than those given a limited range, while another showed that imagining eating M&M's before having access to them cut down on the quantity eaten. Another study had several very fortunate participants watch action movies while eating M&M's, and found that the chaotic diversion made people consume more than if they watched, say, Charlie Rose. 13. THE COMPANY DOESN’T WANT YOU TO EAT TOO MANY. Knowing that consumers these days are increasingly less likely to down M&M's by the handful while watching Die Hard on repeat, Mars has taken a more pragmatic approach. In a letter to the U.S. Department of Health and Human Services and the Department of Agriculture, Mars said it supports government recommendations to limit sugar to 10% of consumers’ daily calorie intake. It also voiced support for a proposed labeling initiative that would list the amount of “added sugars” in candy and other foods. Candy companies typically fight increased regulation tooth and nail, so this is kind of a big deal. At the same time, Mars is trying to stay competitive with other manufacturers like Nestle, which recently announced it will remove artificial flavors and colors from its chocolate. 14. GOOGLE EMPLOYEES HAD AN M&M PROBLEM. Working at Google comes with all sorts of perks, from generous vacation time to free shuttle rides and gym memberships. Employees also have unlimited access to M&M’s, which created something of a problem back in 2012. Apparently workers were eating too many of the chocolate candies, driving the multibillion-dollar company deep into debt (actually, Google was just concerned about their health). To investigate the issue, Google came up with a very Google-esque plan: Dispatch a team of PhDs to study the M&M problem and develop a solution steeped in data. What they found was that the candy’s prominent placement led to lots of drive-by snacking. So the company squirreled the M&M's away in opaque jars and put healthy foods like figs and nuts in highly visible areas. The results: 3.1 million fewer calories consumed over a seven-week period among the New York office’s 2000 employees. 15. THE COMPANY’S NEW JERSEY FACTORY PRODUCES 2 BILLION M&M’S EVERY EIGHT HOURS. That’s more than 4 million made every minute, or 69,000 every second.